I’ll never forget the moment my first batch of goodies from Nirvana Beads arrived. 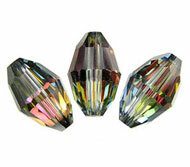 The box was small but quite heavy, and when I opened it I saw rows of teal and red, the glint of light on faceted beads. They took my breath away. Just recently, a nice pile of Czech sun coin beads arrived, and I felt that bead exhilaration all over again. I’ve had an obsession with Nirvana Beads since I first discovered them over a decade ago. They had the best selection of the types of beads I love--earthy, artisan, all that Bohemian glass. And the buttons--no place else had I seen such a kaleidoscope of color. The stunning hues and beautiful shapes spoke to me and inspired my designs. They were my muse. The Czech sun coin necklace and bracelet are the first designs I created for Nirvana. The beads bring some of my favorite elements together: a sleek, table cut design, vibrant colors splashed with an artisan finish. They are rustic yet refined, vintage inspired, and have a touch of whimsy. And they have a lovely celestial motif. The sun is a symbol of power and energy. It has been worshipped as a deity and symbolized as a giver of bounty. It is the crossroads of the equinox, and we revolve around—in more ways than one. It’s also bright, happy, and nourishing to body and soul. And it’s a powerful, positive symbol that has adorned jewelry and other decorative items for millennia. 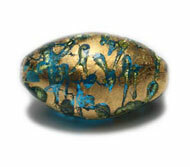 Nirvana incorporates our celebrated sun into this lovely coin bead. The colors are magnificent. The pressed glass shape shows off the smooth, polished glass and highlights the embossed sun. The level of detailing and craftsmanship is excellent. The art and craft of Czech glass bead production dates back several centuries. Table cut beads, sometimes referred to as window beads, are pressed beads that are cut on a special grindstone and are polished to a smooth finish. Like fire polished beads, they go through a heat-treating process that produces their glossy surface. The window glass form shows off the beautiful mixes of color in the glass. The sun coin beads I chose for my design are a larger 22mm size, so they could work alone as a pendant. I decided to go with something different and used them in a statement necklace and chunky bracelet. 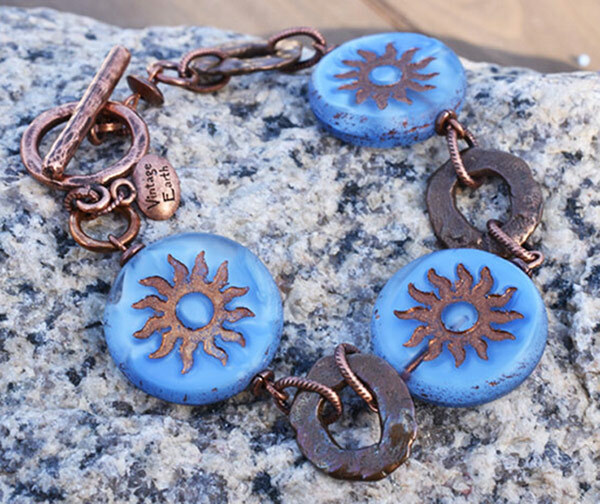 I chose the rich cornflower blue color with the embossed sun in rich bronze. This lovely blue has subtle pearly accents and a silky appearance. The sun color combines well with antique brass, copper, bronze or gold. For both designs, I wanted to really spotlight the sun beads, so I paired them with metals only. I accented the necklace with an ornate copper chain that reminds me of a sun shape. For the bracelet, I used chunky rings of solid bronze, with textured links and a toggle clasp of antiqued copper. The blue, bronze and copper tones came together nicely, and remind me of a desert horizon. Like many jewelry artisans, I’m inspired by the landscape around me. It can be a pumpkin patch in fall, an island cove in summer, or ancient architecture against a blue sky. Texture is equally as important as color. I love beads that feel like rocks, both rugged and smooth. I’m also fascinated by a perfectly faceted round or an ornate button. Even these refined styles are inspired by that leaf on the sidewalk or the sky at dusk. Mostly it is nature that sparks my creativity, and I hope that my work reflects both my love of the natural world and my obsession with rustic style. While I call myself a jewelry designer, I often think of myself as a curator of beads. When a new batch from Nirvana Beads arrives in the mail, the beads end up strewn across my jewelry bench. Sometimes I get to work right away, but other times I just watch them mingle for a while. Each bead has its own landscape of color and texture, so they work well alone. When paired with other beads, these landscapes are limitless. In the case of these sun coin beauties, each bead is its own little universe. On a more personal note, I never imagined I would have the opportunity to create jewelry or write for Nirvana Beads. My jewelry business, Vintage Earth, and my work as a writer, have recently come full circle with my opportunity to write for Nirvana beads. I feel very fortunate to be a part of the Nirvana “family” and be able to play with their beads—both through words and otherwise. 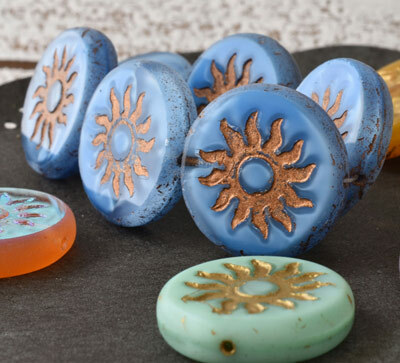 The sun coin beads in Sarah’s jewelry are available in several colors and finishes that are perfect for spring and summer designs. 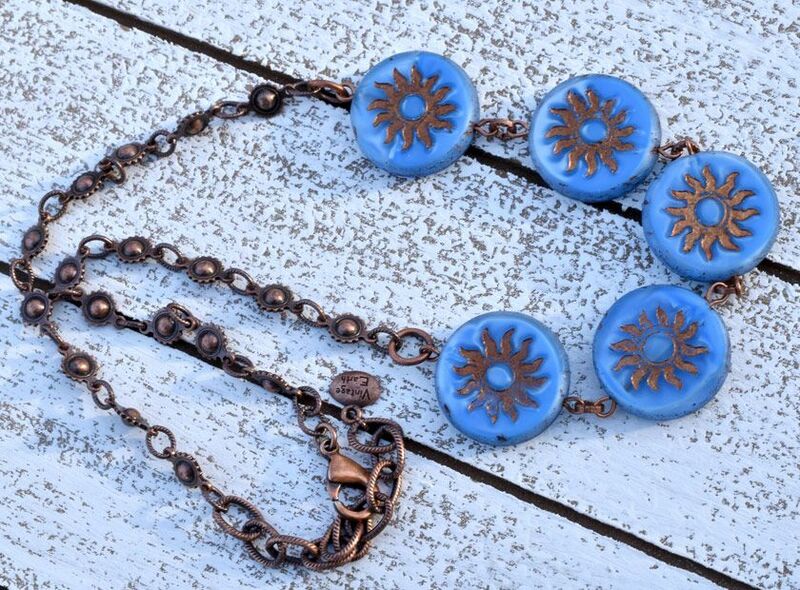 To shop more of these Czech glass sun coin beads, visit our sun coins page. 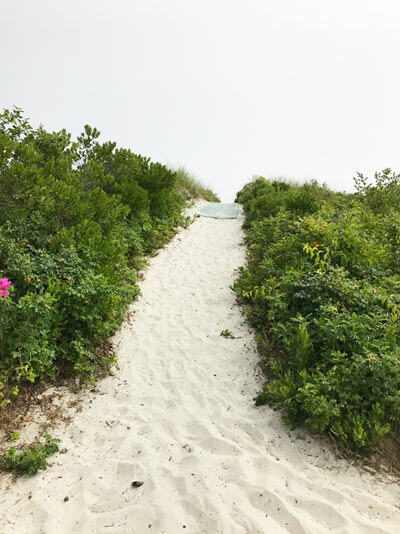 Sarah Aube is a writer and jewelry designer living in coastal Maine.